DataCal manufactures hundreds of quality keyboard labels, also known as keyboard stickers or overlays, designed to make using your keyboard easier and more productive. DataCal labels are manufactured in Gilbert, AZ with durable polycarbonate, 3M® adhesive and are printed sub-surface to provide years of use. Language labels easily convert your keyboard into a bilingual keyboard. We also manufacture alpha-numeric replacement keyboard labels in standard and large print to provide new legends for worn-out lettering or to add a new font or style to your keyboard. Special application labels include those for specific software, user definable labels, and braille labels. 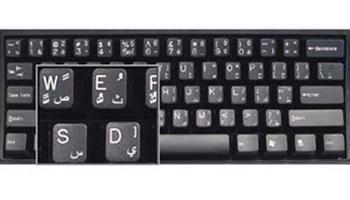 We can also design and manufacture custom keyboard labels to your specifications. Please call 1-800-459-7931 for your custom needs.